Natalie: Hi! My name is Natalie and I'm a chocolate loving, calligraphy obsessed, graphic designer who loves loves loves to travel! I met my boyfriend Thomas on a Study Abroad trip to Italy and we've been exploring the world together ever since. So it's pretty much an addiction at this point. I want to see every corner of the world! I've always enjoyed the rush and even the uneasiness of being in a new place. But the best thing about traveling are the friendships and memories I've made along the way. Thomas: This point in my life pretty much boils down to two things: trying to balance creating my first video game and developing anything and everything for other people to fund creating said game. Natalie: It's so hard to choose but I would have to say Thailand. It was amazing! 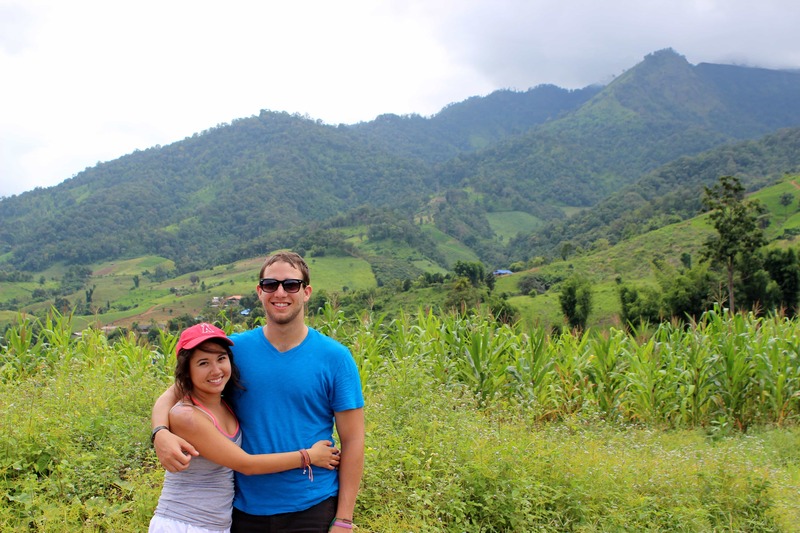 Thomas and I backpacked there for about 5 months and had the most amazing experience. The people there are so friendly, the food is delicious, there's a ton of stuff to do and it's beautiful! We also got in a crazy motorbike accident that left me in crutches for about 2 weeks and Thomas in bandages. But it makes for a good story! Thomas: This is an extremely tough question but if I had to choose just one I would probably say Italy. Full disclosure, I'm Italian so I am completely and shamelessly biased. Nonetheless let me explain why it's so great: First—food quality in Italy is the best I've ever been exposed to. Now if I'm being honest I'm not a huge fan of Italian food (I know, I know) aside from pizza but the sheer quality of the ingredients in Italy means that even the worst meals are pretty damn good. Secondly—Italians are just damn fun. They're not always the nicest, nor are they always the most kind, but dammit if they aren't a whole lot of fun to be around. They also love like nobody else. Thirdly the country is amazingly beautiful. You can't walk one block in Rome without bumping into something amazing. Think that's crazy? The same can be said about Florence, Venice, and bunch of other towns or cities in this country. The sheer amount of beauty is incredible, and it doesn't take long before you start taking it all for granted. All it takes is a trip home to realize how “beauty spoiled” you are when visiting Italy. Amazon Kindle Paperwhite E-reader: This is super essential for me because I love a good book and there's plenty of downtime when you're on the road. When you're traveling or backpacking there are going to be times you're on a long plane ride or a bus ride and a nice good book comes in handy! I usually borrow e-books from my local library so it's also free! Sea To Summit Silk/Cotton Blend Travel Liner: This is probably the best travel item ever. These bed liners are really great to use at hostels or hotels. I'm sort of a germophobe! So I get a much better sleep when I know I'm snuggling in my bed liner. It's super compact so it packs easily and it's super soft. It's also really easy to wash and dries fast because it's lightweight. I highly recommend it! Jackery Bar Portable Charger: This travel-sized charger has saved me so many times. I really like to make sure my phone is charged in case of emergencies especially when I'm abroad. It gives my phone one full charge, has a flashlight (which I've used probably once) and it's very affordable. You never know when your phone is going to lose battery when you need to book a hostel, make a call or get directions. Eagle Creek Pack-It Clean Dirty Cube: In all honesty I'm pretty organizationally obsessed so any packing cube is amazing but this one is really great. It has two sides to it, one is a sort ventilated mesh side that holds your clean clothes, and the other is a completely enclosed water resistant side for your dirty stuff. I can't tell you how many times I have to put dirty clothes back in with my clean ones because I didn't have enough time to wash them before we took off somewhere. This cube ensures that all the stink and potential water from my dirty clothes doesn't rub up against all my freshly washed and scented clean clothes. 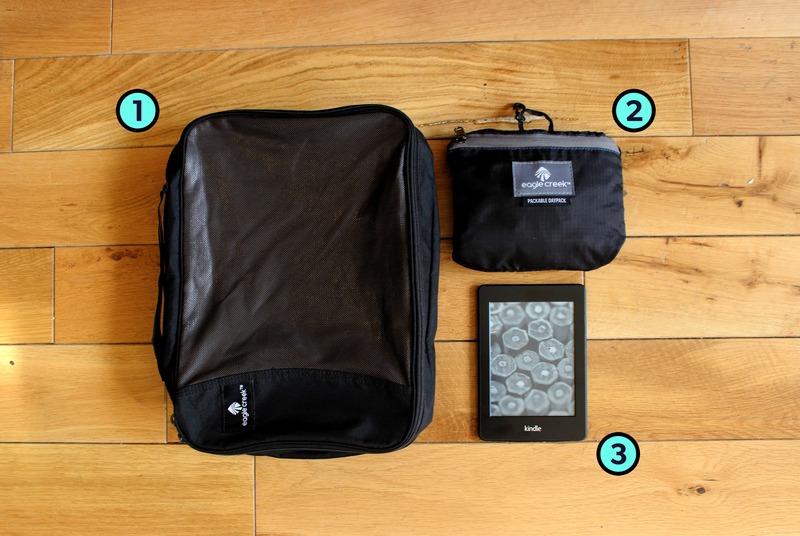 Eagle Creek Packable Daypack: This little backpack is probably one of my most used travel items. It folds up nice an small when not in use (allows for super easy packing) but has a reasonable amount of space unfolded to fit a variety of things inside (macbook 13″, kindle, weekend clothes, water bottle, groceries). Some other things I love about it include how light it is, the very durable nature, and the material used due to how fast it dries when it gets wet. 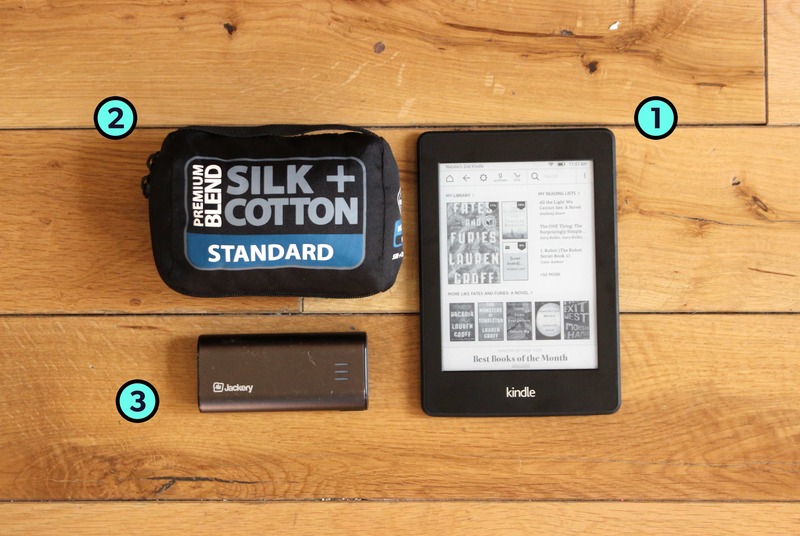 Amazon Kindle Paperwhite E-reader: I love to read but I hate traveling with books. They're big, hard to pack, and cumbersome. Enter the Kindle! Literally this little device is a life saver, the battery life is great (2 – 4 weeks on one charge) it's backlit for when things get dark, and if you have the free 3G connectivity on it you can literally buy a book from almost any country in the world at any time. Did I mention the actual reading experience on it is really nice and that it stores up 1100 books locally? Thomas: Download Google Maps on your phone if you don't already have it, search for the city you are arriving to and press the three little dots at the top right of the screen (more options) and finally press download offline map at the bottom. Now even when you have no service you will always have the map available. Here's what Google has to say about offline maps. If the map isn't available offline for the area, download Maps.Me, it has every area available for offline download and is a great alternative. Download Maps.Me for iPhone or Android. Thomas: I always travel with a deck of cards. I suppose this isn't really all that weird, but they aren't exactly necessary. They are pretty great when you find yourself in a situation with a bunch of people and everyone is looking for an excuse to get together and do something. It's also a reminder to myself that games are a great way to bring people together. Natalie: I think the weirdest travel item I've seen is the Suitcase Robot from Travelmate Robotics. I'm not sure how I feel about robots haha. Natalie: My advice would be to go and take your first trip abroad if you haven't yet. I promise you won't regret it! Thomas: Packing cubes are amazing. Find yourself some that suit you and watch as they change your life. You can follow Natalie's Calligraphy and Lettering work on Threeologie.com. Great article and awesome story!